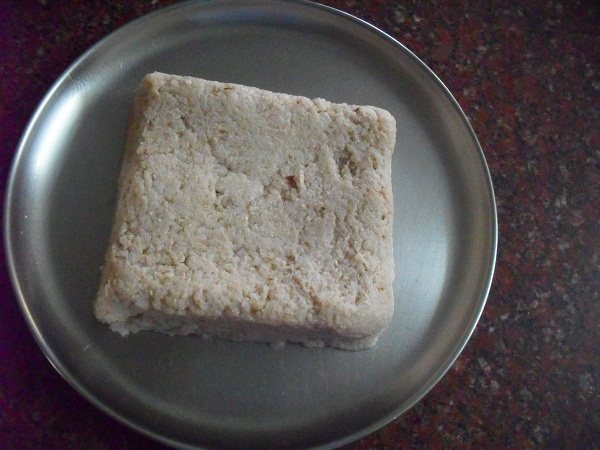 The recipe of Paavakkaai Pitlai has been hibernating as a draft since a very long time. Every time I wanted to publish it there was a festival waiting round the corner and hence I have been postponing the post till now. Today I am posting PAAVAKKAI PITLAI for Mr.Chandra who is an ardent follower of Chitra Amma's Kitchen. 1. Heat 1/4 tsp of oil on medium flame and fry all the ingredients (except the coconut gratings) until it emanates a very pleasant aroma. 2. Now add the coconut gratings and fry for one more minute and switch off flame. 3. Allow the roasted ingredients to cool down and then grind them into a smooth powder. 4. Soak tamarind in warm water and extract a thick juice and keep aside. 5. Pressure cook the dal adding turmeric powder and 2 cups of water until three whistles. 6. Wash and quarter the bitter gourds lengthwise and slice them into medium size pieces. 7. Heat the remaining oil in a kadai and add mustard seeds. 8. When the mustard seeds splutter add the ground nuts and fry till they crackle. 9. 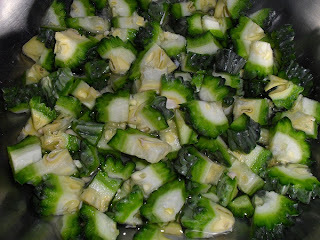 Add the curry leaves and the chopped bitter gourd and fry for three or four minutes. 10. Add the tamarind juice, salt and the jaggery powder. 11. 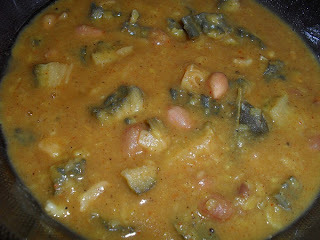 Cook till the vegetable is done and add the cooked and mashed dal. 12. Add little water to the roasted and ground powder and make a paste. 13. 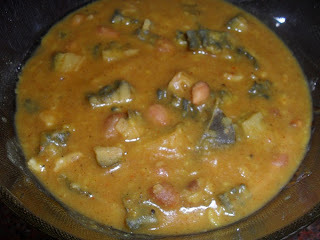 Blend the masala paste and cook the Pitlai for few more minutes till all the ingredients blend well. Enjoy the slightly bitter, sweet and spicy Paavakkaai Pitlai with steaming hot rice topped with a dollop of fresh ghee. Hayagreeva - the horse faced God - is an incarnation of Lord Vishnu and He is the Lord of all knowledge and wisdom. By chanting His name three times with faith before an exam or an interview one is assured of great success in all his/her endeavours. Interestingly a special sweet which is offered as neivedyam to Lord Hayagreeva with great devotion is also called as Hayagreeva. Today being Sri Rama Navami I prepared Hayagreeva as an offering to Lord Sri Rama who is the seventh and one of the most popular avataars of Lord Vishnu. 1. Heat one table spoon of ghee and fry the Bengal gram dal till it emanates a very pleasant aroma. 2. Add two cups of water and pressure cook the fried dal until three whistles. 3. When the pressure subsides remove the cooked dal and drain saving any excess water for later use. 4. 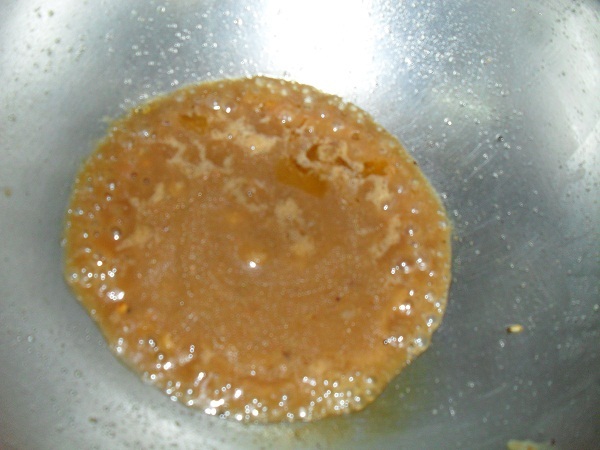 Dissolve jaggery in 3/4 cup of warm water and filter. 5. Add the water drained out of the cooked dal to the jaggery water and cook till it becomes syrupy. 6. 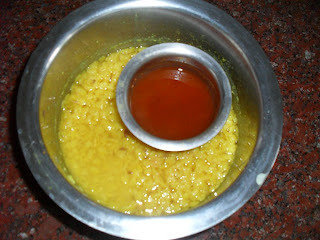 Add the cooked dal (without mashing) and the saffron strands, and keep cooking till the Hayagreeva thickens. 7. Stir in the cardamom powder and one tbsp of ghee and switch off flame when it reaches a porridge like consistency. 8. 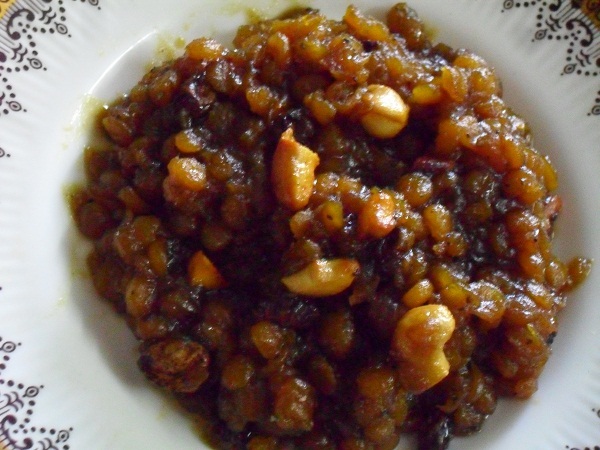 Heat the remaining ghee and fry the cloves, cashew nuts and raisins and mix into the Hayagreeva. 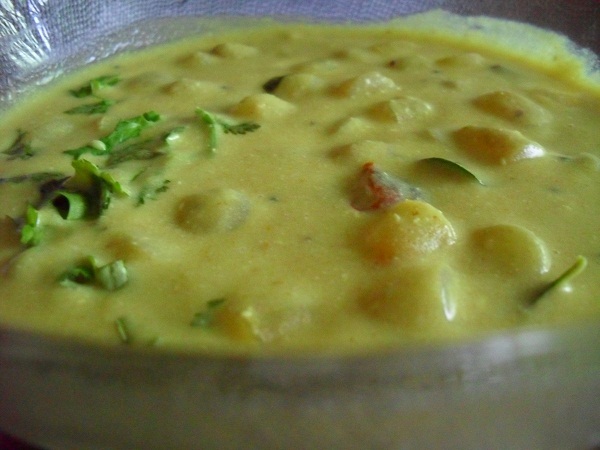 Enjoy the delicious and flavoursome Hayagreeva dripping with ghee while it is still hot. 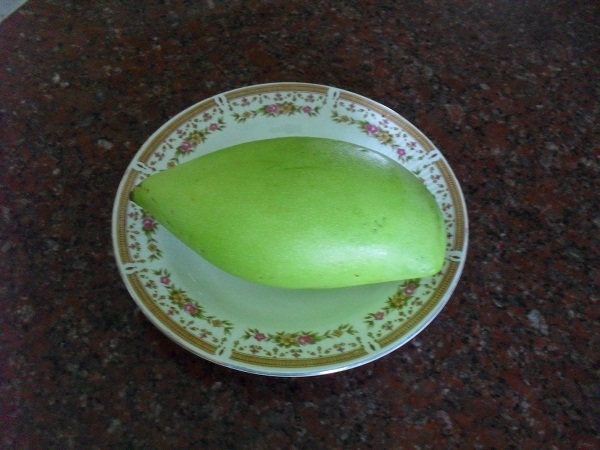 Apart from the significant mangai pachadi, the versatile mango is utilized in many other Puthaandu dishes. 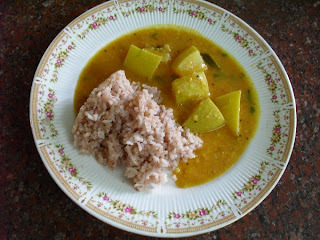 Mango rice, manga paruppu, mango pickles, mango chamandi ! 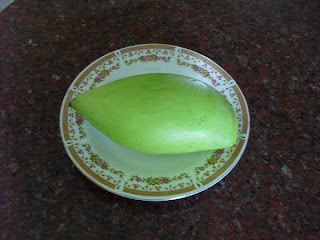 There are an infinite number of mango dishes to pick from, to add to the gaiety of the Puthaandu feast. Here is Manga Sambar for this Varusha Pirappu (New Year). 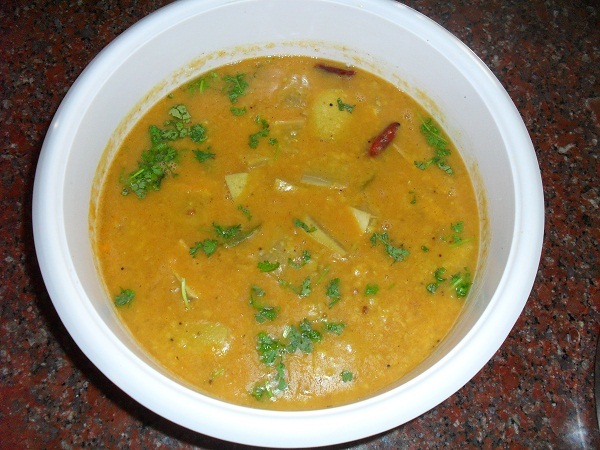 The moderately sour Kili mookku manga is the best option for preparing a delicious Manga Sambar. Coriander leaves - for garnishing. 1. 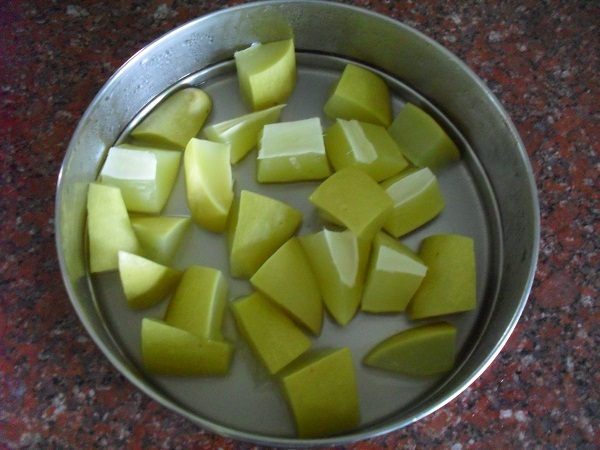 Wash, peel and cut the mango into big cubes after removing the seed. 2. Cook the mango pieces with little water until tender and keep aside. 3. Add turmeric powder and two cups of water to the dal. 4. 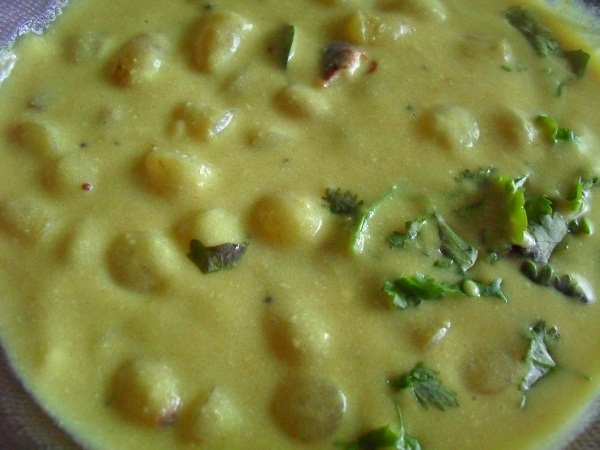 Take a small cup of water and drop the ball of tamarind and add sambar powder into it. 5. Place the cup inside the vessel containing dal and pressure cook until three whistles. 6. When the pressure subsides, remove the dal and mash well. 7. Squeeze out the fiber and add the thick tamarind and sambar powder juice to the mashed dal. 8. Heat oil in a seasoning ladle and splutter the mustard seeds. 9. 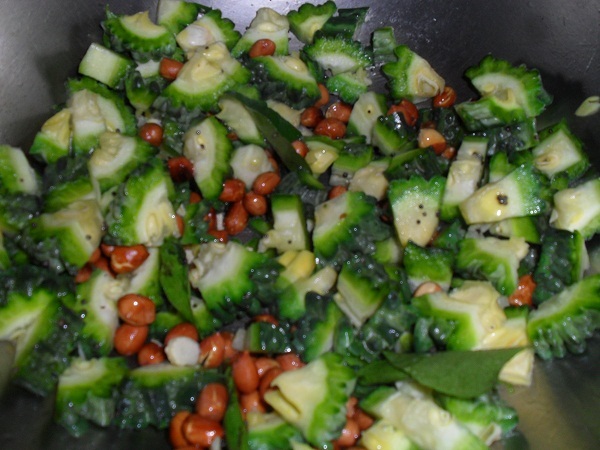 Add fenugreek seeds, broken red chillies and asafoetida. 10. Pour the flavoursome seasoning into the dal and tamarind juice mixture. 11. 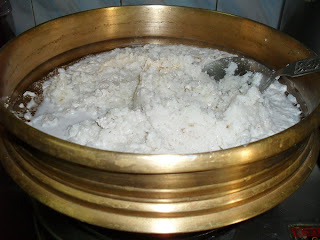 Make a paste of rice flour with little water and mix it into the sambar. 12. Add salt and curry leaves and cook till the sambar starts to boil. 13. Finally add the already cooked mango pieces to the sambar and boil for two more minutes. Enjoy the Manga Sambar with steaming hot rice topped with a spoon of pure ghee and celebrate Varusha Pirappu. New dreams, new aspirations, new goals! It is time to renew and recharge the spirit and welcome a new beginning! Yes, it is time to celebrate Yugadi with a sumptuous Obbattina oota. 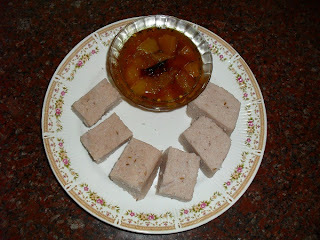 Here is a festive Majjige Huli to relish with the Chitraanna of your choice during Yugadi feast. 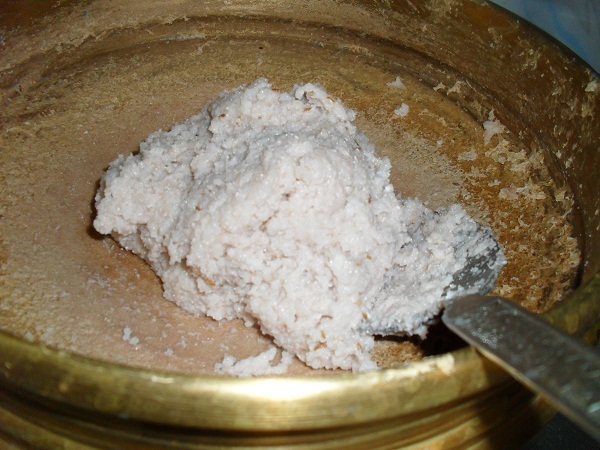 1.Soak and grind the following ingredients into a smooth paste. 3. Heat 1 tsp of sesame oil in a pan. 4. Crackle 1/4 tsp of mustard seeds. 5. Add 1 pinch of asafoetida powder and 2 broken red chillies. 6. 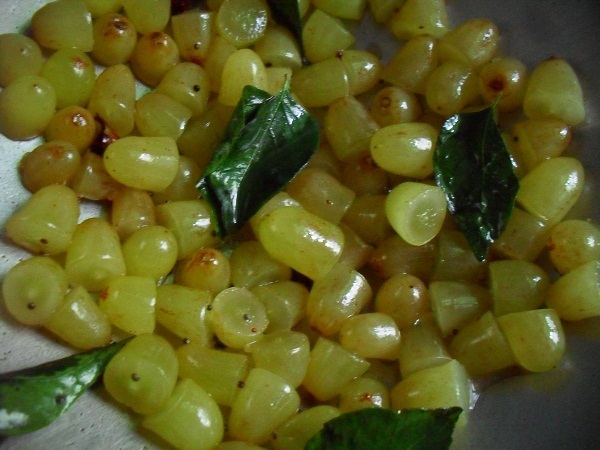 Add a few curry leaves and 2 cups of halved seedless GREEN GRAPES. 7. Saute for one minute and add to the curd mixture. 8. Cook the Majjige Huli on low flame. 9. Switch off flame just before it boils over. Enjoy the Yugadi feast with Draakshi Majjige Huli. A traditional dish cooked authentically using a traditional vessel has its own speciality. Roasting appalams on live charcoal, preparing vattal kuzhambu in a kalchatti or making rasam in an eeya chombu are all only nostalgic memories now. I have been using my beautiful Kerala urli to float flowers since the time I brought it from Thrissur a few years ago. I decided to use the urli for the first time to cook this traditional Vishu dish and experience the old world charm in my kitchen. Using the urli over the gas stove was really exciting. To save time and fuel I pressure cooked the rice and then transferred it to the urli to complete the dish. 1. Wash and soak the rice for one hour. 2. 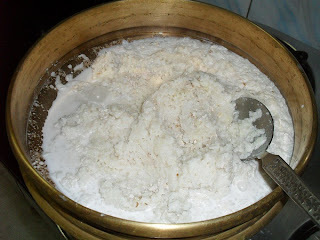 In the mean while grate the coconut and blend with two cups of water. 3. Pass it through a sieve and collect the thick coconut milk and keep it aside. 4. Blend the squeezed out coconut gratings with three more cups of water and extract the second thin milk. 5. Drain the soaked rice and pressure cook with the three cups of second milk, crushed cumin seeds and salt until three whistles. 6. When the pressure subsides scoop out the mushy rice into the urli and add the first thick coconut milk. 7. Cook on medium flame stirring now and then. 8. When the rice starts to thicken keep stirring continuously to avoid burning. 9. Cook till it gives out a very pleasant aroma of coconut oil. 10. When the rice comes together as a whole mass remove it on to a greased plate. 11. Pat it into a thick and smooth cake using a spatula and allow it to cool. Enjoy the traditional Vishu Katta with Mangai Pachadi on the happy occasion of Chittirai Vishu. 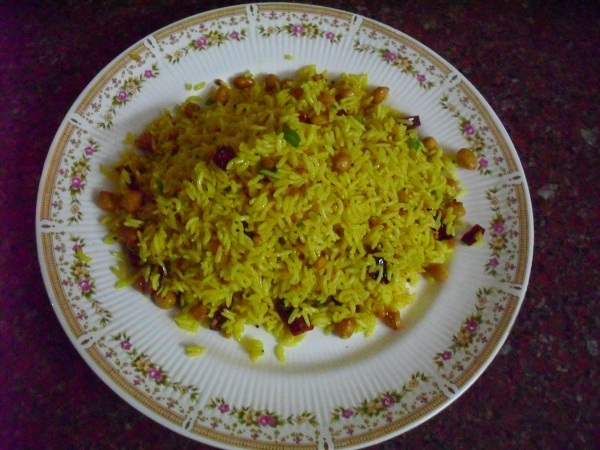 A tangy and spicy Puliodhare or Tamarind rice is an all time favourite South Indian dish. 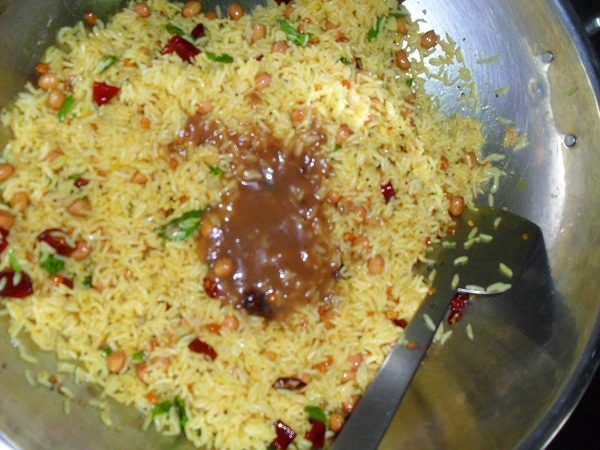 It is the most favoured Chitraanna ('Variety Rice') prepared during festivals. 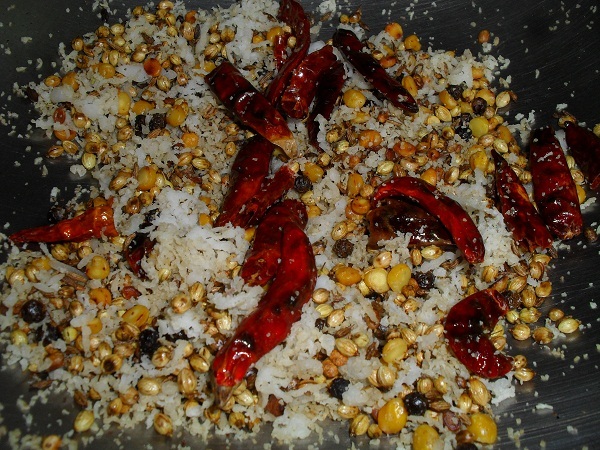 The gojju or pulikaachal for the rice is usually prepared beforehand as it takes a long time to cook. 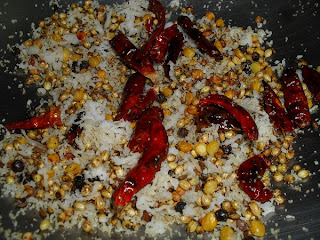 My sister-in-law shared with me a quick and easy method to prepare puliodhare without compromising on the taste. It is almost an instant puliodhare where the tamarind pulp need not be cooked for too long. I was very happy when the Pulihora turned out to be tangy, spicy and delicious. 1. Soak tamarind in little warm water. 2. 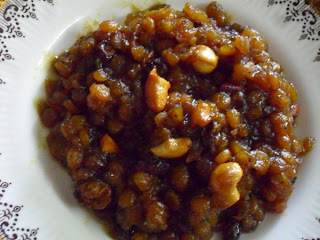 Add jaggery and salt to the tamarind pulp and grind it into a smooth and thick paste without adding too much water. 3. Remove the fibers if any and leave the paste in the refrigerator. 4. Wash rice and pressure cook with 1 1/2 cups of water until three whistles. 5. Spread the cooked rice in a shallow bowl, allow it to cool thoroughly and then break the lumps using a fork. 6. 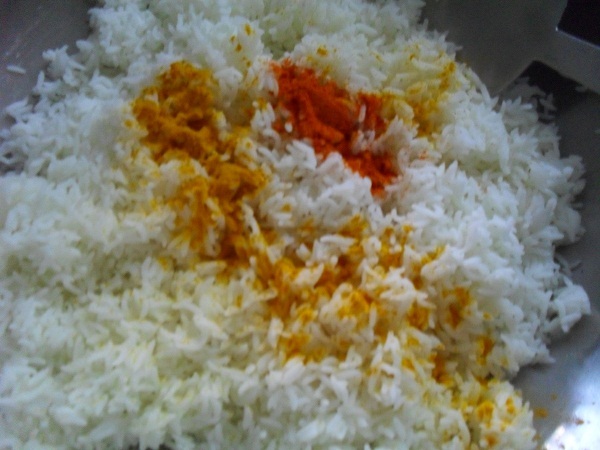 Sprinkle turmeric powder and chilly powder on the cooled rice. 8. When the mustard seeds crackle add the split black gram dal and the Bengal gram dal. 9. When the dals are about to turn golden in colour add peanuts and fry till they crackle. 10. 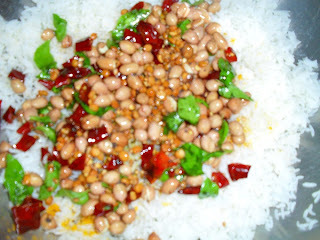 Reduce flame and add the broken red chillies, asafoetida and the curry leaves. 11. Pour the crisp and flavoursome seasoning along with the hot oil over the turmeric powder and the chilly powder sprinkled on the rice. 12. Mix the seasoning uniformly into the rice using a spatula. 13. Heat the same oily seasoning pan and pour the chilled tamarind paste into it. 14. 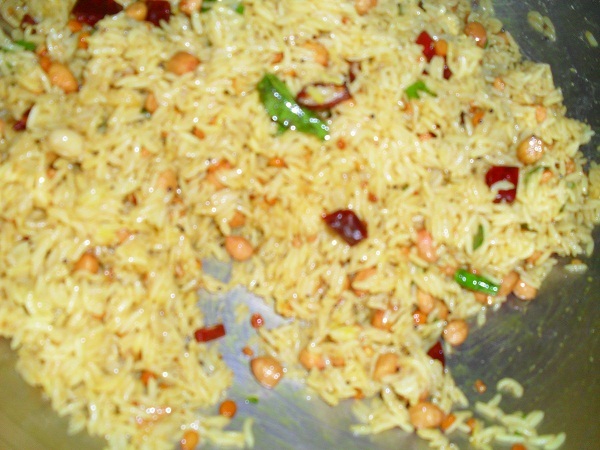 Cook for two or three minutes so that it thickens and becomes like a sauce, and pour it over the rice. 15. Mix well and let it rest for a while so that the rice absorbs the tamarind sauce and all the other flavours. Enjoy the Andhra Pulihora and celebrate a HAPPY UGADI.